Text-to-Speech Software for Linux: If you've been using Mac OS X or Windows Vista before, you may be a bit disappointed to learn that there's no speech synthesizer or text-to-speech (TTS) application that is installed by default on your Linux distribution. For those of you who don't know what a speech synthesizer is, it's simply a computer program that converts normal language text into speech. Text-to-speech software can be of great help particularly for people who are visually impaired and those who are mute. If you've been looking for a free speech synthesizer for Linux, the one that I can highly recommend is a program called Festival. As described from its project website: Festival offers a general framework for building speech synthesis systems as well as including examples of various modules. As a whole, it offers full text to speech through a number APIs: from shell level, though a Scheme command interpreter, as a C++ library, from Java, and an Emacs interface. Festival is multi-lingual (currently English (British and American), and Spanish) though English is the most advanced. 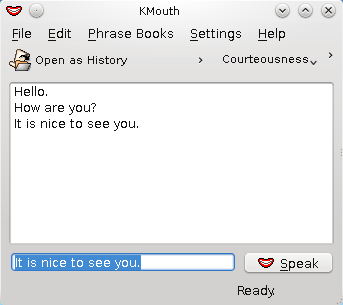 $ dcop kttsd KSpeech setText "Hello World" "en"
For GNOME users, you can use Orca’s speech synthesizer. I haven't tried it yet so for those of you who have, please share with us your experiences of using Orca. ALSO use KMouth. Apps are cross-desktop, ya know? "espeak is available to ubuntu users"
"For GNOME users, you can"
True, but then the user will have to download KDE libraries which is a pain to me! "True, but then the user will have to download KDE libraries which is a pain to me!" Your package manager should handle that for you, so you just have to install Kmouth, and it shold take care of the rest. There are a lot of KDE libraries. I think Amarok requires like 400MB of stuff downloaded if you don't have KDE. It seems a couple of others have already stated it, but here it is again, Ubuntu comes with espeak already installed. I checked my Synaptic Package Manager and espeak boxes were green indicating it was already installed. I didn't have to do anything. 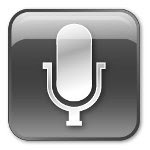 Pros: Voice databases for a wide variety of languages. Comes compiled for Linux or BSD or any of many other platforms. No cost. Perl GPL application available for use in conjunction. Cons: Not Open Source. Distributed only as binary. Rather restrictive license: Binary executable and voice database must be used together; non-commercial and non-military uses only. Thanks for an interesting topic, let it not now trace out in a KDE better than GNOME diskution. I'm dyslexic and Swedish. This allows read and write in Swedish is rather slow, but in English it is almost impossible. Thanks to Google Translate (which I use now), I can solve the writing. And the reading I use a text to speech program because I understand English well. There are a few to Win, which is decent, but Apple is the best. But it is interesting that missed here is that wine is not so much the better, but voting for easier handling, you can just select a text and then have a combination of keys and the text is read out, no cutting paste needs. It facilitates really much! Can this be resolved in X / KDE / GNOME in any way?